Thousands of protestors consumed the streets and major highways of Fallujah in Iraq as they rally against Prime Minister Nouri al-Maliki and his government. The demonstration was the largest of a series of week-long rallies led by the Sunni minority as they band together to put pressure on Maliki and his government, which is led by a Shia majority. Separate rallies have also taken place in Mosul with protestors accusing the government of unequal treatment and a call for the release of Sunni prisoners. Other locations like Samarra and Tikrit also became a focal point for massive demonstrations with province officials and legislators getting involved and echoing their support. The protests began after 10 bodyguards belonging to the finance minister – who is one of the few Sunni senior officials in the government – were detained. Protestors are accusing Maliki and his administration of marginalizing the Sunni minority by not equally distributing the power and denying them equal rights and privileges. The main highway in Ramadi had to be barricaded for the fifth day straight, which brought a halt to transit and the transportation of government supplies. As the demonstration rages on, Maliki spoke at a conference in Baghdad and warned that continued civil unrest could lead to sectarian conflict and bring the country back into the dark days when people would kill each other over trivial religious differences. He also condemned the protestors in Anbar for blocking the roads and disrupting the lives of ordinary civilians. Activists say Iraq’s current terrorism laws unfairly target and penalize Sunnis. 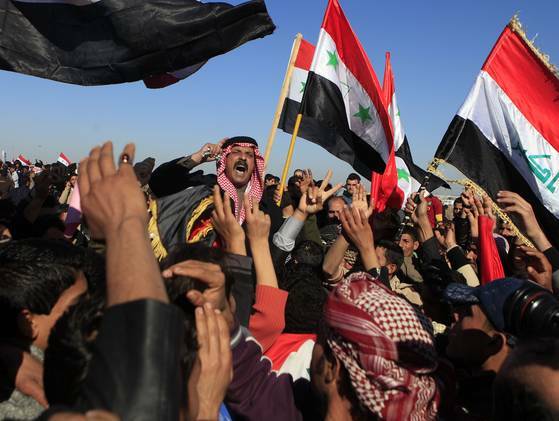 According to a professor from Baghdad University, if the protests do not quell, the Sunnis may begin to seek their own regional autonomy in Anbar where they are the majority. This was what ultimately happened back in 1991 when the Kurds received anatomy from Saddam with the backing of the U.S.